BOYTOY’s style sounds a lot like other surf and grunge rock bands, except for one key distinction –– very few are all-female like this group. 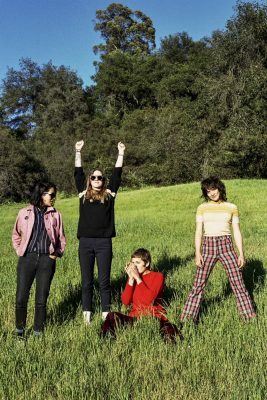 This essentially sums up the vibe of BOYTOY’s second LP, “Night Leaf.” It’s classic stoner rock — or skate rock, or surfer rock — but with a personal twist and more girl power. Untracht-Oakner said that their nature as an all-girl band is not important to their music. They don’t want to be defined by their gender, but it’s important to note that BOYTOY took a traditionally male-dominated space and made it their own. As a band, BOYTOY may push gender boundaries, but their music is rather safe and monotonous. Untracht-Oakner has an almost monotone voice, which is perfectly utilized in this style of music. She barely adjusts her pitch in this song and throughout the album, which further adds to the laid-back tone. “It’s just another song you can’t ignore,” she sings in “It’s Alright.” This seems true at first, but as the listener hears more of the album, the song blurs with the rest of the LP. There are some spots in the album where this consistency feels irritating. The only main variables that change in the record are the guitar riffs. The similarities between “Pretty One,” “Get Off Your Leash,” “Juarez” and “Want” are notable, considering that they’re sequential tracks. Unattentive listeners may fail to recognize a song has changed. Although there aren’t critical faults in the songs, I wished they would be a bit more adventurous. However, in certain areas, BOYTOY shines. The guitar riffs are excellent, and the songs are catchy and fun. The lyrics may be repetitive, but the lines are generally well-written and focus on traditional twenty-something themes of love and growing up. Every song on the record is intimate and an enjoyable listen. One line in “Night Leaf” particularly stands out. Untracht-Oakner sings, “This dream has an ending / Please don’t cry” in “It’s Alright,” which is a very relatable line coming from a band trying to reach its own dreams. BOYTOY knows its genre and executes its style with impressive success despite the music’s occasionally tedious consistency. When BOYTOY steps away from their formula, the missing components in many of their songs become clear. This is apparent with “Cold Love,” the best song on the album. “Cold Love” is slower and even more mellow than the rest of the album and features a toned-down guitar. The quieter acoustics allow Untracht-Oakner’s voice to shine. While her pitch still doesn’t vary frequently in this piece, she has a beautiful voice. Other songs with intense instrumentals cover the softer side to her singing. In the song, Untracht-Oakner sings, “It’s already over / But the light’s still on / Sharp looking but fading.” The lyrics sound like they’re describing “Night Leaf” as a whole. “Night Leaf” is a sharp record that begins with a mellow vibe and gives way to a grunge tone. It becomes apparent over the course of the record that BOYTOY could try a variety of different stylistic elements. Largely, they just stick to one mold. Perhaps their record isn’t the most unique, but it’s fun. It puts a spin on the classics and does it well.